In the Emergency Department, accurate diagnosis in a minimum of time is critical to ensure the best patient outcomes. Every minute counts: you need to identify patients at high risk of a life-threatening condition and rapidly initiate appropriate treatment. At the same time, cost containment and optimized patient flow management are also essential. bioMérieux’s global solution of high quality and cost-effective diagnostic tests will help you safely, effectively and efficiently meet patient needs and contain costs in the Emergency Department. Here’s a story every Emergency Department (ED) clinician can relate to: An 85-year-old man is admitted to the Emergency Department with acute dyspnea. But what is the origin of the symptom? The pressure is on because understanding that means being able to give the right treatment, at the right time. Efficient and fast patient triage is key in the ED environment.1 Effective triage algorithms like the one for the situation described above are needed for every, unique case. High-risk patients must be prioritized; safe discharge decisions must be made; overall testing must be reduced for patient comfort and cost-containment; infection transmission must be prevented ; and above all, appropriate treatment must be initiated as soon as possible. In the ED, you have a myriad of challenges – all of which ultimately rest on your ability to rapidly make the right decisions with the help of the right testing. bioMérieux sees your challenges as our challenges and we’re committed to being by your side with global solutions. The easy-to-use VIDAS® Emergency Diagnostics Solution allows you to have all test results in only 20 minutes, with flexibility to work 24/7. It includes markers of cardiac necrosis, heart failure, venous thromboembolism and severe bacterial infections. Our BacT/ALERT® 3D 120 Combination Module provides accurate recovery of a wide range of microorganisms in blood, sterile body fluids and platelets. Smart workflow enables faster turnaround, better safety and reduced risk of error. Plus, the compact, modular and flexible system takes up barely 50 cm2 of benchtop. And when you have no lab on site? The bioNexia™ lateral flow tests offer rapid results. Whatever diagnostic solutions best address your ED needs, integration of bioMérieux’s solutions to maximize lab efficiency will help you implement better workflow, innovative automation and efficient use of IT solutions. You’ll better ensure the right information is in the right hands, when needed. The VIDAS® D-Dimer ExclusionTM II meets the latest guidelines for diagnostic management of acute venous thromboembolism, which recommend using algorithms that combine clinical probability assessment with a quantitative D-Dimer test 2. This limits the number of required imaging tests, offering cost-saving and prevention of patient harm 3,4. 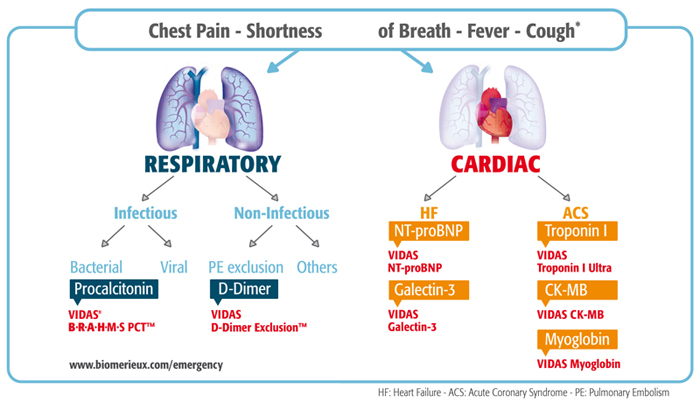 A negative VIDAS D-dimer was shown to safely exclude pulmonary embolism (NPV 99.9%) in 40% of suspected patients with a non-high clinical probability5). The integration of procalcitonin (PCT) into diagnostic and treatment algorithms, such as with VIDAS® B.R.A.H.M.S. PCT™, allows better identification of patients with clinically relevant bacterial infection. This enables more tailored use of antibiotics 6, leading to substantial cost savings7 and is a key part in fighting antimicrobial resistance. In addition to biomarker detection, the BacT/ALERT® 3D Microbial Detection System offers confidence in reliable blood culture results. This easy-to-use blood culture analyzer has been shown to recover up to 97.5% of clinically relevant organisms within 72 hours8, potentially leading to significantly decreased mortality in septic patients9,10. BacT/ALERT® blood culture media comes in triple layer shatter resistant polycarbonate bottles for enhanced safety. In the evaluation and management of patients with dyspnea in the ED, using NT-proBNP, as with VIDAS® NT-proBNP 2, enhances the accuracy of heart failure diagnosis while reducing direct medical costs by reducing length of stay and number of diagnostic procedures 11,12. 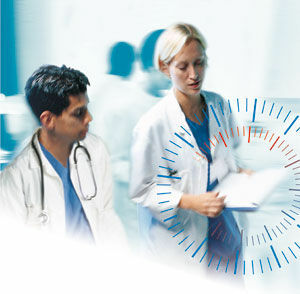 Is your lab in control and confident delivering high quality on-demand results to the medical staff 24/7? Its unique test panel, flexibility and ease of use make the VIDAS® Emergency Diagnostics Solution of benchtop immunoanalyzers particularly adapted to ED requirements and usage. All key emergency tests can be performed on a single instrument, allowing you to manage the STAT samples apart from your routine activity. You ensure the fast turnaround time needed in complex ED clinical situations and the accuracy to give clinicians peace of mind in their decision-making. Besides the ED panel, the VIDAS® menu also includes hCG, Estradiol, markers of infectious diseases (e.g. HIV, hepatitis) and of C. difficile infection, and many other assays. For a comprehensive solution for the sepsis management pathway, combine PCT biomarker detection on VIDAS® with bacterial detection using BacT/ALERT® 3D. You will be able to rapidly deliver clear and accurate information to physicians for early detection of bacterial sepsis, for better patient outcomes. we’ve been at your side throughout the evolution of the challenges you face, like meeting the needs of the Emergency Department. The pressures on the Emergency Department are extremely high. Speed is of the essence, but so is accuracy – because an accurate diagnosis leads to appropriate, timely treatment. Inaccurate or uncertain diagnoses have repercussions beyond the individual patient: time spent on unnecessary tests, for example, means other patients are waiting. And the costs affect the whole system. At bioMérieux, we are acutely aware of these challenges and the role that leading-edge diagnostics play in that context. That’s why we look at the whole picture and develop global solutions. We are a partner you can trust because our prime motivation is and always has been the same as yours: protecting and improving human health. Huisman MV, Klok FA. Diagnostic management of acute deep vein thrombosis and pulmonary embolism. J Thromb Haemost. 2013;11:412-22. Righini M, et. al. Influence of age on the cost-effectiveness of diagnostic strategies for suspected pulmonary embolism. J Thromb Haemost. 2007;5:1869-77. Wiener RS, et. al. When a test is too good: how CT pulmonary angiograms find pulmonary emboli that do not need to be found. BMJ. 2013;347:f3368. Carrier M, et. al. VIDAS D-dimer in combination with clinical pre-test probability to rule out pulmonary embolism. A systematic review of management outcome studies. Thromb Haemost. 2009;101:886-92. Schuetz P, et. al. Procalcitonin algorithms for antibiotic therapy decisions: a systematic review of randomized controlled trials and recommendations for clinical algorithms. Arch Intern Med. 2011;171:1322-31. Wilke MH, et. al. The use of a standardized PCT-algorithm reduces costs in intensive care in septic patients - a DRG-based simulation model. Eur J Med Res. 2011;16:543-8. Barenfanger, J; et. al. Decreased Mortality Associated With Prompt Gram Staining of Blood Cultures. Am J Clin Pathol 2008;130:870-876. Doern GV, Vautour R, Gaudet M, et al. Clinical impact of rapid in vitro susceptibility testing and bacterial identification. J Clin Microbiol. 1994;32:1757-1762. Moe GW, et. al. Canadian Multicenter Improved Management of Patients With Congestive Heart Failure (IMPROVE-CHF) Study Investigators. N-terminal pro-B-type natriuretic peptide testing improves the management of patients with suspected acute heart failure: primary results of the Canadian prospective randomized multicenter IMPROVE-CHF study. Circulation. 2007;115:3103-10.